New Intel Chipsets: Good For Musicians? Intel's latest chipsets are finding their way into new PCs — but do they offer any advantages to the computer musician? As I write this at the end of June 2004, the first motherboards featuring Intel's new 915P (Grantsdale) and 925X (Alderwood) chipsets are appearing from manufacturers including Abit, Asus, Gigabyte, MSI and Intel themselves. They herald the start of a new era for Intel-based PCs, with loads of new features. Let's start with the new LGA775 (or Socket T) CPU socket. This is a completely new way of interfacing Pentium 4 processors to the system buss, and in a radical departure from previous designs it places the pins on the socket rather than the processor. Motherboard manufacturers have apparently been complaining that this puts up the cost of their half of the assembly tenfold, although initial concerns about the socket's fragility seem largely unfounded. The extra 297 pins of LGA775 are mostly to supply power, and Intel have also improved thermal performance so that heat can be removed more efficiently. For musicians this is a possible plus, since it enables the use of a new heatsink and large-bladed fan that can apparently spin at lower speeds, and even stop if temperatures drop sufficiently. Intel have already released a new 3.6GHz Pentium 4 model in the LGA775 package, along with repackaged versions of various other slower models. All of them use the Prescott core that Intel first introduced in their Pentium 4E processors to manage clock speeds higher than 3.6GHz, but apart from the new packaging nothing else has changed internally. As with the Dothan processors discussed in last month's column, the new Pentium 4 models adopt a new and confusing numbering scheme, with the 2.8GHz version becoming the Pentium 4 520, while the the 3GHz, 3.2GHz, 3.4GHz and 3.6GHz models follow on as the 530, 540, 550 and 560 respectively. 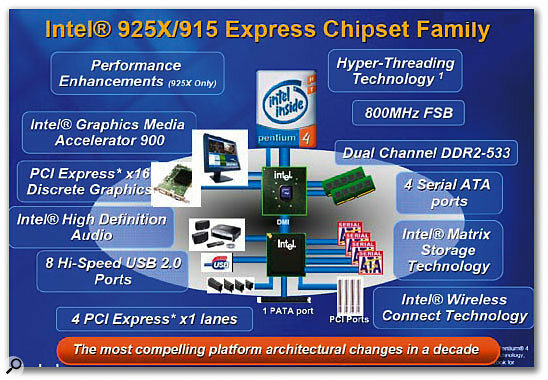 The 925X chipset roughly replaces the existing 875P Canterwood, while the 915P replaces the 865P Springdale range. Both support the new 800MHz LGA775 processors, dual-channel DDR2 memory, up to four PCI Express x1 slots, and one PCI Express x16 slot for the graphics card. DDR2 memory is more flexible than its predecessor, allowing (for instance) a pair of 256MB DIMMs to be paired with a single 512MB DIMM to run in interleaved dual-channel mode, and the memory controller supports a bandwidth of up to 8.5GB/second. Only the 925X supports ECC (Error Correction Code) RAM for extra security, but the 915 chipset supports a slower 533MHz in addition to the 800MHz System buss, and slower (and cheaper) DDR400/333 memory as well as the faster DDR2 533/400 memory. In practice, most motherboard manufacturers will only provide DDR2 support with the 925X chipset and partner the 915P with DDR, for a significantly cheaper product. The PCI Express x1 expansion slots use a high-speed serial buss and are only about an inch long, but offer double the bandwidth of a standard PCI socket. For graphics work, multiple 'lanes' are used to increase this bandwidth still further. The 915/925 both support PCI Express x16, using 16 lanes for up to 4GB/second bandwidth to and from the graphics card (ideal for Microsoft's forthcoming Longhorn operating system). Both chips still support up to six PCI slots, but AGP support has been abandoned. Four SATA-150 ports and one PATA/100 IDE controller are available for attaching drives, and there's Intel's Matrix Storage Technology (MST), which supports two new features. One is NCQ (Native Command Queuing), which executes hard-drive commands out of order if this results in fewer disk rotations or seeks to find particular data, but it's only currently supported by Seagate's Barracuda 7200.7 series. MST also lets you use RAID 0 and RAID 1 on the same set of drives — so, for example, in a twin 200GB-drive setup you could create a 100GB RAID 0 (Stripe) array to achieve more simultaneous 24-bit/96kHz audio tracks, and devote the remaining space to a RAID 1 (Mirror) volume for extra security of other data. Intel's Wireless Technology is also built into both chipsets, but sadly no-one has yet been able to test this aspect of them, because Intel don't yet have the feature working. Finally, Intel's new HDA (High Definition Audio) replaces the now-archaic AC97 standard with support for up to eight channels of audio in formats of up to 24-bit/192kHz on the motherboard. However, before you get too excited about not ever having to buy a soundcard again, it's best to bear in mind that a typical HDA motherboard codec will only offer A-D (recording) conversion with an 85dB signal-to-noise ratio. Most soundcards designed for musicians manage signal-to-noise ratios of at least 100dB, giving less background noise on recordings. Since I last looked at version 4.0 of the versatile universal sample converter CDxtract, in SOS October 2002, it's had quite a few incremental updates, improving the various conversions and adding new destination formats on the PC version — such as SampleCell, the new EXS24, Kontakt, Kurzweil, Reason NNXT, NI Battery, and VSampler 2 import. Now version 4.2 adds several significant new options, including NI Kontakt and Recycle import, export of all supported formats to Muon's DS404, a new DropSound utility for playing WAV and AIFF files, and further enhancements to the existing translations. CDxtract 5 is already in development and promises a completely new interface and several new features when it appears at the end of this year as a free update to registered users. I don't normally advertise products until I've seen them with my own eyes, but this case is an exception, since the developers are actively seeking suggestions for improvements or new features. Check out www.cdxtract.com. I reviewed Iomatic's Registry Medic in last month's column, and since then I've found another related utility that I can recommend. Regseeker not only cleans the registry, but also lets you examine such things as startup entries, colour schemes and application histories, as well as providing a set of OS tweaks like those of Microsoft's TweakUI. However, for me its most useful function is 'Find in registry'. This lets you enter a word or phrase and then displays every reference to it in a single list. This is far easier to use than Regedit 's simple Find function (which displays one reference at a time), and is ideal if you're trying to remove references to an old soundcard. After I had removed Audiotrack's Maya 44 and its drivers from my review partition, Regseeker still found 62 'Maya' matches, most of which had not been added by the soundcard itself, but were references to it in Cubase and Pro-53 's lists of ASIO, DirectX and MIDI driver entries. Overall, I didn't find Regseeker quite as thorough as Registry Medic at cleaning the registry, but every cleaner I've tried seems to find a slightly different list of problem entries, so it complements the latter very well. The best news is that it's freeware. Find it at www.hoverdesk.net. So what are the implications of all this for the PC musician? Well, as I said way back in PC Notes November 2002 (when first discussing PCI Express), we won't have to abandon our PCI soundcards just yet. Most motherboards featuring the two new chipsets generally have four PCI slots and two PCI Express ones, or just two PCI slots and one PCI Express slot, plus the new PCI Express 16x graphics slot in both cases. This is understandable, since there are so few PCI Express cards yet available. The main fly in the ointment is that initial test results with the first 915/925 motherboards are disappointing. Their performance is equalled in many cases by an Intel 875 and P4 Northwood, and they're soundly trounced by AMD's new Athlon 64 3500+, 3700+, and 3800+ models. The 925X does out-perform the 915P by some one to three percent because of its DDR2 RAM, but this option is considerably more expensive considering the small increase in performance. A problem with the Grantsdale chipset also resulted in Intel recalling it just a week after its launch. Moreover, the Prescott core also runs much hotter than the Pentium 4 Northwood series, so for the time being, at least, if you want a quiet PC for audio work, a 915/925 model won't be suitable. As always, it pays to stay on the sidelines until the teething troubles are thrashed out. I suggest at least six months. Do you find that your various drives and partitions seem to be assigned drive letters in an almost random order, so that you're often left searching up and down the list for a particular drive in the left pane of Explorer? This can become particularly annoying with a multi-boot PC, since you may find that particular partitions get a different drive letter in each boot, so they change order in Explorer's list. And have you ever thought how convenient it would be to always have your CD drive appear in Explorer below your various hard drive partitions, rather than wherever Windows thinks fit to place it? 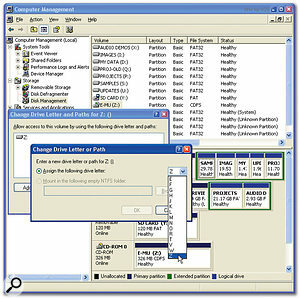 Finding your data could be even easier once you abandon Windows' drive letter allocation and choose your own, as shown here.Well, you can do all this, courtesy of the Disk Management extension of Windows XP's Computer Management tool. 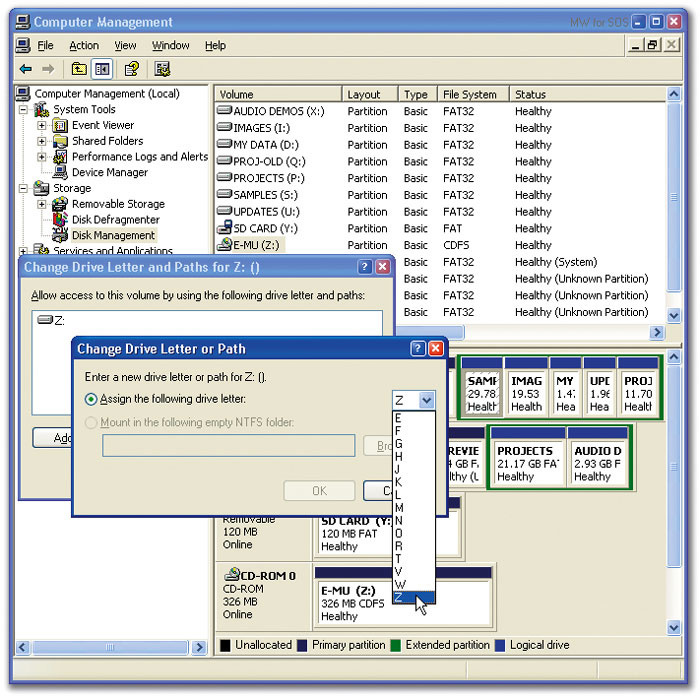 Launch the Computer Management tool. Do this from Control Panel, by clicking on the Administrative Tools applet and then on Computer Management, or by launching Windows XP's Run dialogue, using the Windows-R shortcut, and typing 'Compmgmt.msc' (but without the quotes) into its text box and pressing Return. Next, click on Disk Management in the Storage section, and by default all your drives will appear in the right-hand pane as both a list of volumes and a graphical view beneath. To change the volume letter (and hence its position in Explorer's list) simply right-click on it in either view and choose 'Change Drive Letter and Paths...', click on the Change button in the window that appears, and then choose another currently unassigned drive letter from the drop-down box. If you want to swap the letter with another existing volume, just assign it another temporary unused letter, change the other drive to the now released letter, and then change the letter of the first to your desired letter. You can't change the drive letter for your system or boot volume, as this must always remain as 'C:'. In addition, 'A:' and 'B:' are reserved for floppy drives, but otherwise the sky's the limit. I find themed letters are best, such as 'P' for Projects, 'S' for Samples, and 'U' for Updates. My CD drive is 'Z:', so it always appears at the bottom of the list, and if you have any removable drives, such as external Firewire or USB models or memory cards, these are easier to spot near the bottom too. You won't be able to change the drive letter on a partition if it houses a page file, although of course you could change the location of the page file first. Also, watch out for any applications that rely on specific drive letters and paths to find associated files — while it's normally fairly easy to relocate audio files belonging to a particular song if they've moved, some apps — such as the Spectrasonics soft synths — lose track of their huge data files if you change the drive letter of the partition involved, and show an error message when you next try to use them. However, Spectrasonics have now provided the SpectraMove utility on their web site (www.spectrasonics.net) to take care of problems like this for PC users. It lets you move the data safely while preserving Registry entries, or repair them if you've changed the drive or path name.